Although I should expect it by now, the voice in Robert Ashley’s compositions always catches me unaware and unprepared. Last week, I took a quick trip to New York to hear his latest work at Roulette on Wednesday, December 11. A world premiere, Ashley’s Mixed Blessings, Indiana threw the voice as an instrument onto new compositional ground, continually growing in urgency and building in layers until a burst of light and sound brought closure, showing yet again why Ashley is a foremost composer of our time. The Swiss trio Ensemble Tzara performed Ashley’s composition, which was bookended by David Sontòn’s La metta da fein and Timothy McCormack’s Interfacing with the Surface, both US premieres. In the middle of these exceptional instrumental pieces, Ashley’s use of the voice was especially set off—to hear a performer’s voice, suddenly, changed my perception of the whole concert. The trio is made up of horn player Samuel Stoll, cellist Moritz Müllenbach, and synthesizer player Simone Keller. Although Ashley’s use of voice tends toward the emotionless, hearing each performer’s voice added a sense of the human to a radically electronic, futuristic sound. Open, sustained notes in cello and synthesizer began the piece, acting as a foundation for the first vocal part. As the work progressed, all three performers rotated in 16 sequences of speak-singing at the microphone in the center, continuously shifting the instrument color and voice timbre. Understated rhythm from the synthesizer, especially, added texture to the underlying chords. Ashley created the text from a random set of leaflets advertising books in today’s trivial American literature. The resulting hissing and cracking of consonants was the Rhaeto-Romanic translation of book titles, authors, abstracts, hard- and soft-cover numbers, e-book numbers, and empostazium labels from the randomly-selected set of leaflets. At the first instance of the heavily accented “E S B N” and “W W W punckt!” I heard a ripple of laughter, but the performance took a more serious turn with a lighting shift from soft blue to green that marked Keller’s first turn at the microphone. Because the voice plays such an intricate role in Ashley’s compositions, the choice of performer—the individual timbre of a voice—is critical. Not just anyone can perform a given part. 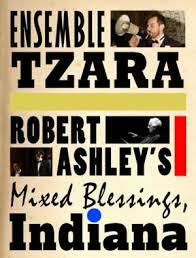 Each performer in Ensemble Tzara had a distinct, select tone that danced over the heavy language. The initial switch from Stoll to Müllenbach, for instance, felt drastic. Stoll spat out words vengefully, while Müllenbach spoke calmly in a profound, monotone voice that slowly developed into a more urgent tone conjuring visions of enchantment or incantation. Stoll and Müllenbach took several turns at the microphone before Keller did, adding a sense of intentionality to her voice. Once all three voices were in the mix, rotations happened more quickly, more seamlessly. The lighting shifted at what felt like a faster rate until a marked change to red at the end. The sequences began to blend, somehow, coming together finally (but remarkably, I had to remind myself, still remaining separate) in a genius, closing chord.